More than 3.6 million airline passengers flew through Tucson International Airport (TUS) in 2018, making it one of the 10 busiest years in the airport’s 70-year history, the Tucson Airport Authority reported at its annual meeting Monday (January 28). 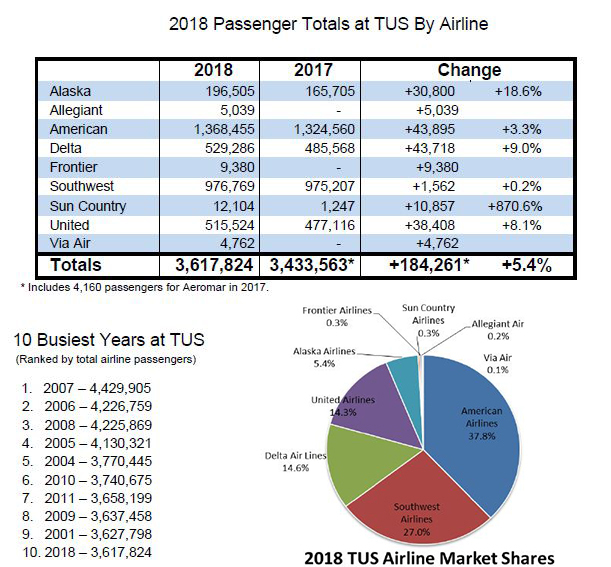 The increase was attributed to airlines adding new destinations, using larger aircraft and the November arrival of ultralow-cost carriers (ULCC’s) Allegiant and Frontier, along with the return of Sun Country, which resumed seasonal service for a second year in December. Airlines continue to make adjustments to their schedules and, going into 2019, Southwest Airlines added weekly nonstop flights on Sundays to its hometown airport, Dallas Love Field.